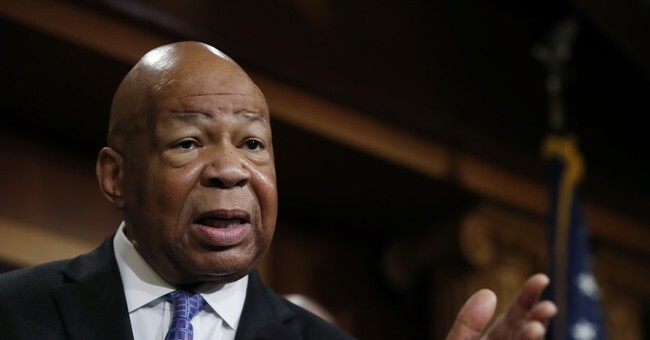 House Oversight Committee Chairman Elijah Cummings (D-MD) last month sent a letter to former Fox News host Diana Falzone asking for her to provide documentation about the conservative cable network's decision not to run reports about Stormy Daniels' alleged affair with President Donald Trump. Although Falzone has a Nondisclosure Agreement (NDA) with Fox, her attorney said NDA's exclude government investigations. According to a report from The New Yorker, Falzone had specific details about Daniels' alleged affair with Trump and the amount he allegedly paid her to keep her quiet. “She had the amount, she had the corporate names that the original settlement was named in, she had the dates of the affair and she asked me to confirm those details," Daniels' attorney, Keith Davidson, told MSNBC. There are so many things wrong with the Democrats' take on this. For one, they're launching investigation after investigation because they want to find something to run that makes Trump out to be a bad guy. The Russia probe proved to be one giant waste of time and taxpayer money so now they're seizing upon whatever they possibly can. The Democrats have had an issue with Trump taking on the mainstream media and calling out their fake news. They've gone to bat for CNN, MSNBC, The Washington Post and The New York Times. They're all about protecting the "freedom of the press" except when it comes to Fox News. You know why? Because Fox bucks their narrative and actually waits until evidence is there to corroborate what's being said. Executives like LaCorte weren't going to publish a news story that could ultimately be false. They wanted to have their ducks in a row with proof in their hands. That's not "protecting the president." It's called being a responsible journalist. One thing to keep in mind though: the freedom of the press allows each outlet to have their own editorial agenda and point of view. Editors can decide if and what they publish. Story selection happens and that's up to each outlet to decide what's right for their editorial point of view and their audience. There is absolutely nothing that said Fox had to run with this story, even if there was corroborating evidence (which there wasn't). Democrats are moving to get explanations for editorial decisions made by a private entity and it's absolutely dangerous. This moves us one step closer to the government controlling what information is put out there and what information is kept quiet. It's what other parts of the world – Hello, China! – have done to control their population and keep dictators in power. The freedom of the press is supposed to serve as a check on government. The watchdog function the media has would no longer exist if various government committees and groups had say in every story that hit the front page or made it on network television. This piece has been updated to include Ken LaCorte's title as a former Fox News executive.